Baladak was about the freedom to express our city through our eyes, calling on graffiti and wall artists from around Jordan to participate. I painted a duck with broken wings, reflecting how many of us in the city feel. Faced with “don’ts” “can’ts” and other social taboos, we are raised to believe we cannot (and should not) try to achieve more than our potential allows. 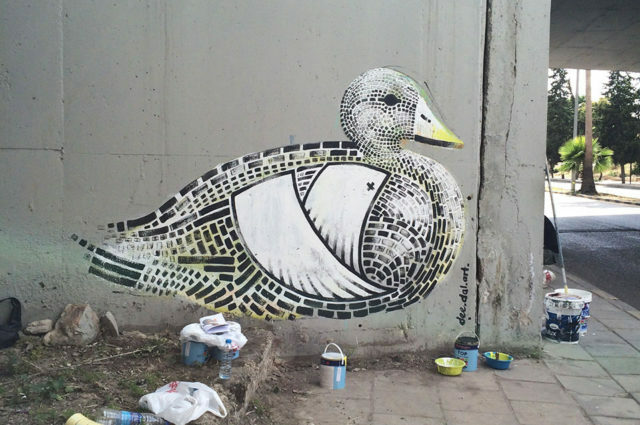 The female duck is one of the most sexually harassed by its male counterpart I chose it as a symbol of the discrimination women face, not only in the Arab world, but globally. The piece was covered up the day after it was painted.